NASHVILLE — Leading tech companies like Facebook, Google and Twitter are censoring the online posts of Christians and conservatives — and if this trend continues, it won't be long before free speech in America is gone, conservative leaders have warned. During a session on public policy and online censorship attended by The Christian Post at Proclaim 18, the National Religious Broadcasters' (NRB) International Christian Media Convention, U.S. Rep. Marsha Blackburn shared how, last year, Twitter blocked a campaign video in which she discussed her efforts to stop Planned Parenthood's "sale of baby body parts." When Blackburn pushed against the social media company, Twitter told her the video was removed because it was deemed "an inflammatory statement that is likely to evoke a strong negative reaction." "That is how pro-life language was treated," Blackburn said. "I said, 'To me, harvesting and selling baby body parts evokes a very strong negative reaction.' ... I stood my ground, and eventually Twitter relented." "When you censor free speech for one, you censor it for all," she added. "The video went back up on Twitter. That's the kind of stand that we have to take when tech oversteps." Dennis Prager, conservative talk show host and cofounder of Prager University, shared his own story of online censorship. PragerU, he said, has released hundreds of educational, conservative-leaning videos that have garnered millions of views over the years. "The word has gotten out that we are a force, mainly because we are changing minds," Prager said, explaining that the goal of PragerU's videos is to "give intellectual ammunition to those on our side and challenge those in the middle and those on the other side." "As a result, we have become the focus of some attention on the left," he said, revealing that about 40 of PragerU's videos have been placed on YouTube's restricted list, which cannot be viewed in libraries or educational institutions, mainly because the list is for pornographic and extremely violent content. Refusing to remain silent, Prager sued Google, the owner of YouTube. "The case is very simple," he said. "There is a fraudulent aspect to what Google represents itself to be. It says, 'We are an open forum.' They're not. They're a left-wing forum. If our lawsuit fails, what will happen is they will be given judicial sanction to make the internet what the university has become — a world closed off to non-left wing, even closed off to liberal thought." Prager said it's important to differentiate between "liberal" and "Left." "The Left is the antithesis of liberalism and the antithesis of conservatism. That is what needs to be made known. Google is Left. Liberals allow free speech. Leftists never did. Since Lenin until Google, it hasn't." Prager warned that if judges allow Google to continue censoring content, the internet "will be Berkeley" before long. Marjorie Dannenfelser, president of the Susan B. Anthony List, said that the pro-life movement today relies largely on social media to spread its message — and that's exactly what the Left is trying to suppress. "There's a history of trying to shut down," she said. "To shut that down means to shut down the core of our Constitution and our founding documents. It simply cannot happen, and it is. The consequences are pretty horrendous for our nation, honestly." Dannenfelser highlighted several posts by the Susan B. Anthony List that have been censored by Twitter and Facebook, including one that included a quote from Mother Teresa. Twitter's bias against conservatives was made all the more apparent when an ad promoting Planned Parenthood was left untouched. "We must band together, whether in lawsuits or in the public forum in the communicating loudly to companies like Twitter and Google," she said. "The consequences to the restoration and the preservation of our rights are too high, the consequences are too much." Radio talk show host Larry Elder said that in his experience, reporters today are overwhelmingly left wing and perceive conservatives "not just to be wrong but to be evil, to be corrupt" and that "there's something fundamentally wrong with us." "The Left thinks people who believe in God, believe in the Constitution, believe in the Second Amendment have fundamental moral problems," he said. "That's what we're up against." 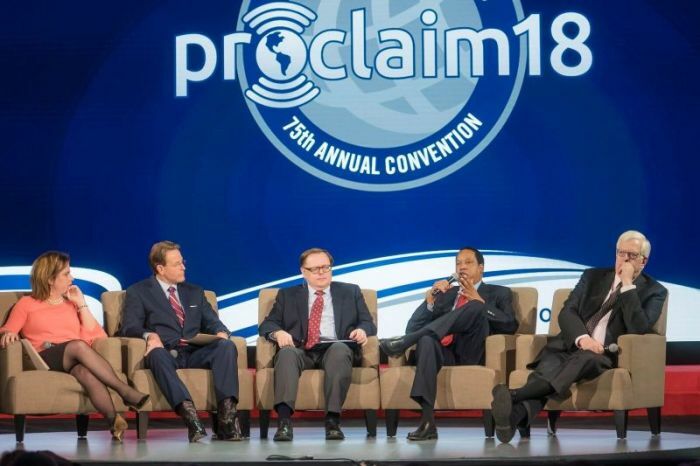 Family Research Council President Tony Perkins said that as "fake news" continues to become more rampant, it's up to Christian and conservative broadcasters to "use every tool available to push back on the Left's intent of silencing" them . "We are going to wake up one day and free speech in America is going to be gone," Perkins said. "It is time to roll up our sleeves and fight for the first freedom that we as Americans enjoy." The speaker and author said social media platforms "are holding themselves out to be the virtual public square," and thus need to be "open to all ideas." "America is only strong and America can only prosper when you have the free flow and exchange of ideas," Perkins said. "There's no question about it, we are a divided nation. But silencing one half of America is not going to bring peace, and it is not going to bring America together. It will only further divide."